Expert Ed Rosenthal takes you through the entire life cycle of the marijuana plant, giving advice from see selection to harvesting. He explains the factors that influence: Growth rate, Light, CO2, Temperature, Nutrients, Water. 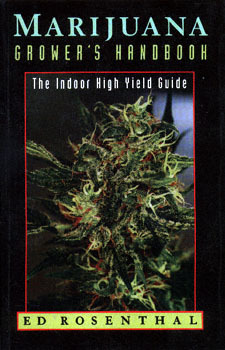 A great index, bibliography, tables, and charts make this one of the easiest reference books available for marijuana. A new chapter provides tips and solutions to the most common indoor growing problems. "Ed, the famous Ask Ed ... is an entire set of encyclopedias when it comes to growing pot. If knowledge is power, Ed Rosenthal is General Electric." "He's the man who wrote the book on growing pot; a world-travelled cannabis researcher who's brought back cultivation secrets from every part of the globe."